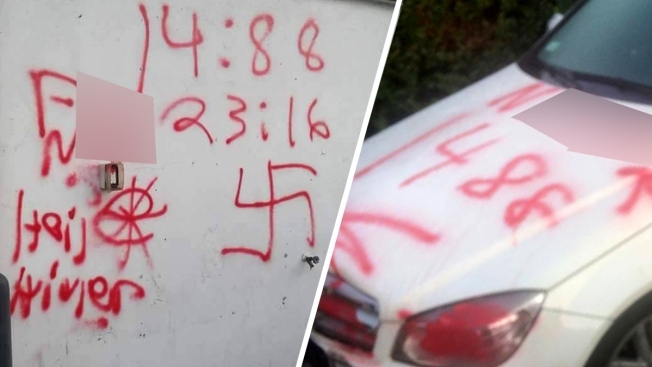 Crude, racist graffiti damaged several properties and a car in Coatesville, Chester County, when vandals struck sometime early Tuesday, Aug. 22, 2017. A Pennsylvania man convicted of spray-painting graffiti including swastikas and racial epithets in several places near Philadelphia has been sentenced to seven to 14 years in prison. Judge Patrick Carmody told him that ``being drunk'' "doesn't excuse being racist.'' He said the defendant was trying to scare people and incite violence.